First cut a 5 3/4" x 9" piece of green card stock and fold it in half for the base, a 4 1/4" x 5 1/2" piece of red for the middle layer, a 4" x 5 1/4" piece of patterned paper for the front, a 2 1/4" x 4" piece of green for the tree's background and a 2" x 3 3/4" piece of white for the tree. Next using a Stamp a ma jig stamp the tree in Stampin' Up! Garden Green ink then the ornaments in Garden Green, Real Red and Pretty in Pink inks. Then punch the corners with a Stampin' Up! Ticket Corner Punch, attach it to it's background then to the base. Next punch the sentiment's background with a Fiskars scalloped oval punch then cut out the sentiment with a Spellbinders Classic Ovals die. Next stamp the sentiment in Real Red ink, attach the sentiment to it's background then to the base with mini pop dots. Then stamp the star in Stampin' Up! Daffodil Delight ink, cut it out with a Stampin' Up! 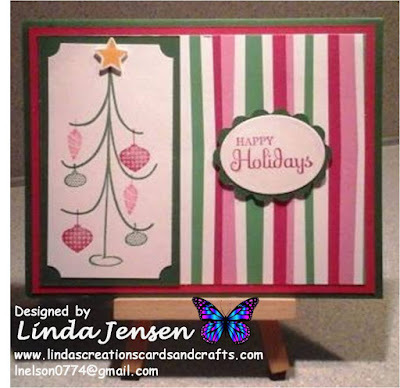 Holiday Collection die, attach it above the tree with a mini pop dot, attach the front layer to the middle layer then to the base and enjoy!